Welcome to Journalism 201, students. I’m instructor Fitzpatrick — you can call me Mr. Fitz — and I’ll be taking you through this single-session course, worth five credit hours toward your journalism degree. I know that all of you got A’s in Journalism 101, otherwise you wouldn’t be here today. One…Pay attention. If I can’t see your eyes, you’re not listening. Two…Turn off all electronic devices and store them away. Otherwise I throw them out the window. Three…No gum chewing. NO GUM! If I see your jaw moving with your mouth closed, you’re going to the dean’s office. …Hey, hey! You with the tattoos on your neck and ring through your nose…Stop laughing! I’m not talking about almonds, cashews, salted nuts or genitalia. There’s nothing funny about the nut graph. This may be the most important, single lesson you learn about journalism, so hark back to Rule No. 1. What does it say? That’s right…pay attention! That’s precisely right! It’s the key paragraph, found within the first few paragraphs of a lengthy story, that summarizes what the story is all about and why it’s important. It’s the story “in a nutshell.” It’s the one paragraph that is responsible, in many cases, for either keeping the reader reading or losing his interest right off the bat. …What’s that, young lady right up front here with the mid-thigh skirt and gray-green eyes? Do I have examples? Of course, I do! Let’s take a look at the front page of Sunday’s Kansas City Star. Feature writer Eric Adler wrote this story about young people who already have fallen into alcoholism and have turned to Alcoholics Anonymous. Adler starts with an anecdotal lead, describing the young people arriving for a typical AA meeting, this one in a storefront room. Those who introduce themselves include a 20-year-old woman, a 23-year-old woman, a 25-year-old man and a 17-year-old girl. What does Adler do in that graph, students? …He tells us something we know — that binge drinking is a big problem — but then he layers it with information that a lot of us probably don’t know — that “thousands of young people” have given up the illusion of partying and have acknowledged that they suffer from a serious illness and want to get better. Also, putting the icing on the cake, so to speak, Adler reminds us that this story is topical: It’s time for hundreds of thousands of students to descend on warm-weather destinations for a week of drinking and all-out partying. That graph probably propelled tens of thousands of readers to the “jump,” where he examines the problem in the equivalent of a full page of text. A job well done by a seasoned journalist. …Hey, hey! You with the black trench coat on…What the hell was that that you just let fall out of your coat sleeve into your hand? Was that a cell phone I saw?…It was your watch, you say? Well, whatever it was, I don’t want to see it again, you understand? You don’t need to know what time it is, anyway…You’re on JimmyC time now. Let’s take a look at this Saturday story in The New York Times about the New Jersey trial of the guy who had his Web cam trained on his roommate, Tyler Clementi, while Tyler was making out with a boyfriend in his dorm room at Rutgers. As you know, Clementi committed suicide a few days later, and his roommate, Dharun Ravi, is being tried on three felony charges, including invasion of privacy and bias intimidation. “A symbol of their collective pain…” Isn’t that a nice turn of phrase, students? It not only describes the breadth of the issue but directs your empathy toward the result of the psychological cruelty. OK, so that’s it, students. Now, what I want you to do after you leave here is, when you read significant stories in the coming days — either online on in print — look for nut graphs. When you find them, think about them…Do they adequately summarize the stories? Are they well crafted? Also, look for stories where you would expect nut graphs but can’t find them. It happens a lot. Not all papers and other publications make them as high a priority as they should. Hey, wait a minute…you with the trench coat…Can I borrow your cell phone? I left mine at home and need to call my wife to see what she wants me to pick up at the store. A big fire is burning down at City Hall, and the fire chief is heading for the hills. City Manager Troy Schulte and Mayor Sly James have pinned Chief Smokey Dyer into a corner with their directive that he come up with a plan to cut $7.5 million from the Fire Department’s budget. In his 2012-2013 budget message to James last month, Schulte proposed cutting 105 firefighters. Fire calls, he said, have dropped by more than 60 percent the last 10 years, largely because of improved building codes, inspections and fire prevention education. Clearly, he implied, a bulging firefighting force was no longer needed. Dyer’s and the fire union’s response? They chirped like birds whose nests were being threatened, saying such a cut would compromise public safety. As the screeching went on, Schulte and James wisely put the ball in Dyer’s court, directing him to come up with his own plan for saving $7.5 million. Dyer, who is nearing 65, has made it clear he wants no part of a significantly trimmed-down department. A City Hall source said Wednesday that Dyer was thought to be close to resigning after Schulte’s and James’ directive that he figure out how to cut more than 100 of the department’s 1,370 positions. Now, it looks like Smokey has cooled off a bit…enough anyway to hang on until he gets a nice golden parachute. And on Thursday the council accommodated him by approving a retirement incentive package. As it is, the city’s retirement plan is only available to a member of the firefighters’ pension system after 25 years of service. Dyer has been the chief slightly more than 11 years. 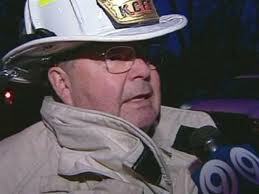 Previously, he spent 13 years as fire chief in Lee’s Summit before retiring from that city. I think the ordinance that the council approved is good: A fire chief who has served for at least 10 years, even if he came from another city, should be eligible for a decent pension. Good fire chiefs are hard to find. And, as some council members said, the 25-year-rule could make it difficult to recruit top-notch fire chiefs who did not rise through the KCMO ranks. Dyer has been very popular with the firefighters and their union, Local 42, because he has been able to help them get big, fat salaries and raises without sacrificing any manpower. Now, however, Smokey’s and the fire union’s real good thing is about to come to an end. The city can no longer afford a 1,370-person department where firefighters salaries average $56,000 and they get bigger raises than other city employees. Something’s got to give: In some way, shape or form, the fire department is going to suffer. The council has only itself and earlier councils to blame, of course: it was elected council members, worried about running against fire union opposition, who caved in repeatedly to former firefighters’ union president Louie Wright. It’s enough to make you clench your teeth, but it’s hard to bring about real change because Local 42 is so damned powerful politically. They back their candidates with money; they vote; and their families vote. On the other hand, many people who complain about how the special interests get what they want don’t bother to vote and, in many cases, don’t even keep themselves informed on day-to-day developments. In a way, the apathetic get what they deserve. But enough of that sermon…back to the here and now. As this face-off advances, it will be interesting to see just how hard and far James is ready to push against the union. After all, he was elected last year with firefighter union support, and he almost surely will seek re-election in 2015. At Thursday’s council meeting, he gave an indication of a softening of position. We’ll probably end up with some sort of compromise where fewer than 50 firefighting jobs are cut and the budget gurus come up with a “previously unidentified” few million bucks — look what we found! — that makes the union happy. For now. But by the time that happens, Smokey might have hit the door, or he’ll be mighty close.